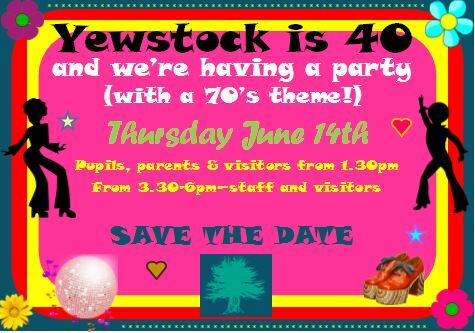 40th Anniversary celebration – Thursday 14th June. We will kick things off at 1.15pm with a party for pupils, and anyone else who wishes to join us (parents, past pupils and staff all welcome). The party will continue after pupils have gone home until 6pm. Again, past pupils and staff are welcome to join us, and we will have tours around the school and college so you can see what’s changed. There is a 70’s themed fancy dress, so you may want to start planning costumes now. There’s plenty of inspiration from the decade – disco, punk, glam rock, TV shows… We will have a costume parade in the afternoon to see all the efforts. We’re really looking forward to seeing people on the day. You can let the school office know if you would like to come, or simply just turn up on the day.